The guy behind Tennessee's "Don't Say Gay" bill is at it again. 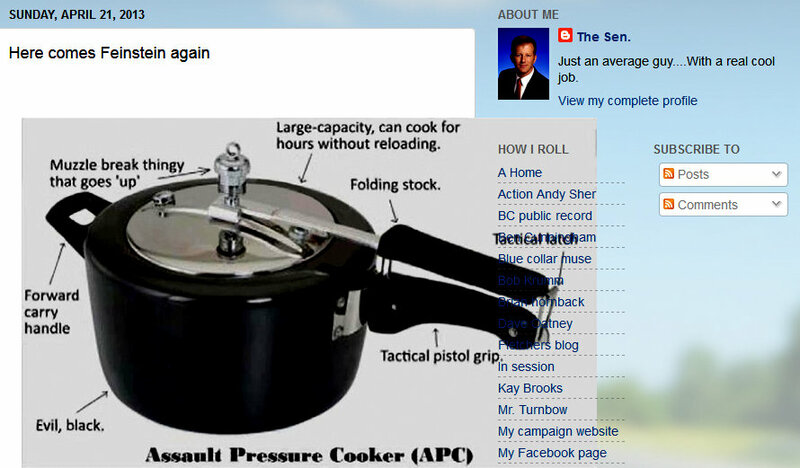 A Tennessee state senator is being slammed for insensitivity to the Boston Marathon bombing victims after posting an illustration of a pressure cooker – like the ones used in last week’s deadly attack – to mock gun control advocates. Republican Stacey Campfield posted an illustrated image of an “Assault Pressure Cooker” on his personal blog Camp4u on Sunday. “Here comes Feinstein again” he titled the post in a reference to Sen. Dianne Feinstein, who authored an assault weapons ban in the wake of the massacre at Sandy Hook Elementary School. The pressure cooker illustration is then labeled with features similar to those of a gun – like a “tactical pistol grip” and “folding stock.” “Large-capacity, can cook for hours without reloading,” it also says. Campfield has refused to apologize or remove the post. Some commenters on his blog are backing him. PREVIOUSLY ON JMG: Campfield's "Don't Say Gay" bill first passed before the Tennessee Senate Judiciary Committee in April 2011, and then passed out of the House Education Committee in February 2012. It did not pass before either full chamber. In January 2012 Campfield was booted out of a Knoxville cafe by its owners, who were angry about the bill. Also in January 2012 Campfield appeared on the Michelangelo Signorile Show to declare that "straight people don't get AIDS." In January 2013 Campfield reintroduced his "Don't Say Gay" bill with an added portion that requires teaches to out gay students to their parents. Earlier this month Campfield introduced a bill that would cut public assistance to families if their children get low grades.